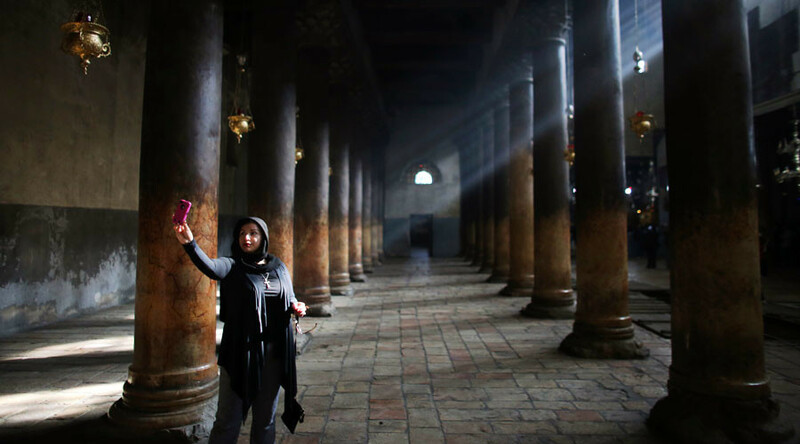 The Palestinian National Authority has been making increased efforts to attract tourists to its historical religious sites. However, earnings from tourism are still meager with the West Bank under tight Israeli control. Watchtowers, barbed wire, and rifle-toting Israeli soldiers can't be an attractive sight for tourists heading to Palestine to walk in the footsteps of Jesus, to see the Church of the Nativity and to eat some tasty hummus. They hardly ever remain overnight. The government data shows that last year tourism rebounded with 2.4 million foreign visitors. The figure is slightly higher against 2.2 million the year before but is still below the 2.5 million in 2014. At the same time, very few visitors spend the night in the Palestinian territories. Hotel stays by foreign visitors declined from 1.1 million in 2014 to 906,000 last year, compared to 8.5 million tourists staying in Israel in 2016. According to the most recent data, Israel earned over $6 billion from tourism last year, while Palestinian areas reported less than $1.1 billion in 2014. The annual rush to Bethlehem at Christmas does not bring these lands enough revenue. Tourists spend the day visiting the Holy sites and leave without spending much cash. Moreover, most visitors go to Palestinian areas via Israel, which gets the first crack at serving them. Political tension does not help the occupied territories attract tourists. “If we had an independent state, it would be magnificent,” said Saeb Erekat, Secretary-General of the Palestine Liberation Organization (PLO), who puts hope on Christians flocking to Bethlehem year-round, bike trails through the Jordan Valley and sunbathing and spas on the Dead Sea. — RT (@RT_com) 24 июня 2016 г. The Israel Incoming Tour Operators Association hardly disputed the complaint. “All tourists go through our system. Palestinian areas are an extension of our product,” said the head of the association as quoted by Bloomberg. — RT (@RT_com) 17 марта 2017 г. At the same time, Palestinian infrastructure can hardly provide competition with European-quality roads, cafes, and hotels that Israel can boast. There’s only one five-star hotel in Bethlehem, but it hasn’t seen any repairs in years. The city has few to offer the travelers compared to Jerusalem’s Old City attractions. Manger Square, a city square in the center of Bethlehem, is surrounded by gift shops selling cheap olive wood renderings of the Madonna and Child, pearl-inlaid boxes, and T-shirts saying “I Love Palestine.” It takes a visitor an hour to explore the old town beyond the square. The Walled Off Hotel is one of the most recent attempts to hook in some tourists. Opened by the London street artist Banksy, the guesthouse boasts “worst views of any hotel in the world,” as the windows of its ten rooms look out on to the 5-meter graffiti-covered concrete wall built to prevent Palestinians from getting into Israeli territory. — Maitreya Rael (@maitreyarael) 5 марта 2017 г. The three-story hotel has a low-lit bar, and restaurant decorated like a British colonial clubhouse, with ironic works by the artist covering the walls. The inn is fully booked until June. “We hope to raise international awareness of how ugly this wall is and in that way contribute to peace,” says hotel manager Wissam Salsaa.